At exactly 12:00 NOON On Thursday, January 20th, the staff and student population of Lake of Two Mountains High School were assembled right outside the front entrance of the school, at the base of the two flagpoles, already bearing the Canadian and Quebec flags. The reason was to commemorate the addition of a third. This one was furnished by “Peaceful Schools International”, a non-profit organization, dedicated to the banishment of aggression and intimidation from the playgrounds, halls, and classrooms of schools everywhere. It was a day long awaited for the past few years, as the staff and students of Verdun Elementary finally raised the flag of PSI, emblematic of being a member of Peaceful Schools International. It was also a special moment for Pastoral Animator Mary-Anne Fyckes who spearheaded this effort tirelessly the past several years. It was a dignified occasion suitable for an elementary school, which included an afternoon filled with songs, speeches from invited guests and the moment that every awaited, when Judy Grant, coordinator of Peaceful Schools for the LBPSB, proudly proclaimed Verdun Elementary, a member of Peaceful Schools International. PSI was founded in 2001 by Hetty Van Gurp in Halifax, after seeing a need for peace education. Miss Van Gurp was involved in her own personal tragedy as in 1991, Hetty’s older son Ben died, following an act of aggression by another student who had been bullying him at school. Ben was just 14 years old. Before founding PSI, Miss Van Gurp was involved in peace lessons in and around Halifax and then across Nova Scotia. The afternoon began with invited guests and students from Beurling Academy under the guidance of teacher Miss Debi Dixon, who is actively involved in peer leadership at BA, going around the various classrooms and helping the VE students make paper butterflies which were to be hung later in the gym. Miss Fyckes proudly welcomed everybody to the event and after the playing of the national anthem; then it was the opening address of VP Miss Sylvie Martin, who was standing in for Principal David Chisholm who was unable to attend on this day. After the presentation of the PSI flag by Miss Judy Grant, it was the turn of representatives of parents, staff, and two grade 6 students to make statements and pledges of peace for the school to operate in an atmosphere of peace and security. It was an afternoon for all to be proud of. Board chairman Marcus Tabachnick and the Allion school choir accept Peaceful School award from Hetty van Gurp on behalf of the Lester B. Pearson board. The board is the first to receive the honour. Lester B. Pearson School Board officials might have been proud recently to receive a Peaceful Schools flag from the founder of the movement, Hetty van Gurp, but it was van Gurp herself who was proudest that an entire school board had adopted her philosophy. It is the only school board on the continent to have done so. Schools mostly sign up for the Peaceful Schools initiative individually, but the Pearson board embraced van Gurp’s ideology from the beginning in 2002 and encouraged all of its West Island schools to participate and to become peaceful schools. So when van Gurp presented Pearson officials with one of the organization’s flags for its head office in Dorval, she did so knowing that it was the only school board headquarters in North America that would have one of her flags flying. And for van Gurp, who lost her 14-year-old son in a violent bullying incident in 1991, it was as proud a moment as she could have to honour the memory of her cherished boy. "It is very unusual to have a whole school board do this," van Gurp said in an interview. "They are the one and only school board, and to me they represent the pinnacle of success. I am hopeful that other school boards will follow their lead." Van Gurp’s Peaceful Schools International is based in Nova Scotia and includes about 300 schools in 14 countries as members. While not every Pearson school flies a Peaceful Schools flag, all have participated in workshops to learn the Peaceful Schools philosophy and all work at keeping it going in their schools. Lester B. Pearson School Board officials may have been proud recently to receive a Peaceful Schools flag from the founder of the movement, Hetty van Gurp, but it was van Gurp herself who was proudest that an entire school board had adopted her philosophy. So when van Gurp presented Pearson officials with one of the organization’s flags for its head office in Dorval, she did so knowing that it was the only school-board headquarters in North America that would have one of her flags flying. Anyone is welcome to register for the "We Choose Peace" Symposium to be held at Lakeside Academy – 5050 Sherbrooke St., Lachine, Quebec on May 15th. Friday the 13th may be unlucky for some, but at North Queens Rural School there was a much more positive energy in the air. 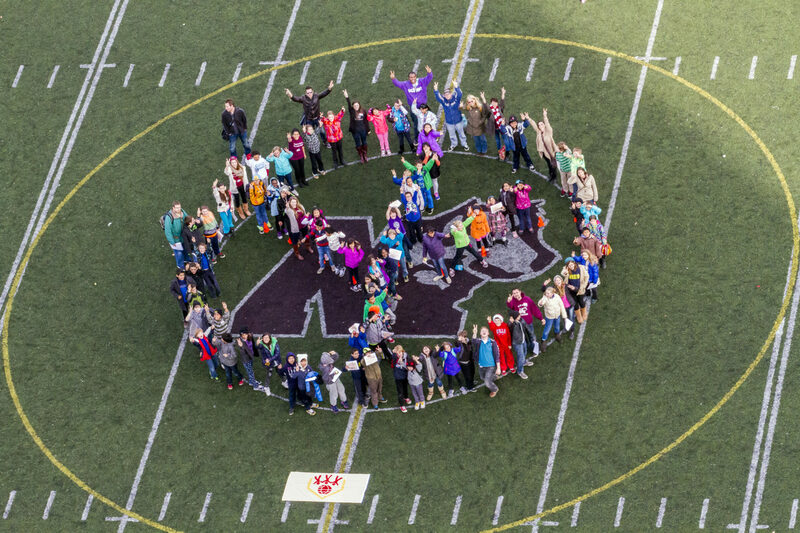 On Feb. 13, the school held its ‘Peace Day’, which involved the entire school from Primary to Grade 12. “It shows peace can happen, it can work if you’re willing to try,” said student Nicholas van Dyk, one of the organizers of the day. The idea for holding a Peace Day was born out of an anti-bullying workshop the South Shore Regional School Board put on in Nov. One teacher from the elementary level and junior/senior high level, along with three students from the school, attended the workshops. They also heard from Hetty van Gurp, founder of Peaceful Schools International and whose own son died after a bullying incident in 1991. St. Aidan’s Christian Brothers Primary is thought to be the only school in the world with a dedicated ‘Peace Room’. The school is one of five in Northern Ireland to have official Peaceful Schools International (PSI) status. Ten of its pupils act as peace ambassadors. Annapolis Royal is well known for its high quality of life. The country of Sierra Leone, on the other hand, consistently finds itself at or near the bottom of the UN’s Quality of Life Index. In 2004, while Annapolis Royal was being recognized as the world’s ‘Most Livable Small Community’ by the UN-endorsed LivCom Awards, Sierra Leone was occupied by UN peacekeepers and in the process of trying past leaders for war crimes. One might assume, therefore, that there would be little to connect Annapolis Royal to the struggling African nation, aside from a moral obligation to share our bounty with those who are less fortunate. Not so, says Carolyn van Gurp, who spends eight months of the year in the Western African nation working for a charity called CDPeace.